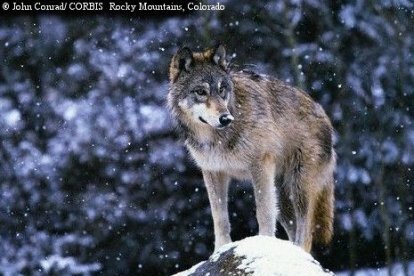 The Northern Rocky Mountain Wolf was classified as gray wolf subspecies Canis lupus irremotus in 1937 by senior biologist Edward A. Goldman. The Northern Rocky Mountain wolf is a light colored wolf of medium to large size, averaging from 85 to 115 pounds. The largest found on record was 145 pounds. Bison made up a large portion of its diet until the herds of bison were wiped out. So, when the wolves were forced to switch over to feed on cattle, they were intentionally driven to extinction.